In an archipelago of achingly beautiful islands, these twin peaks — perfect sheer-sided cones, rising abruptly from the sea — may be the most stunning sight of all. Whether you approach by boat, into the mile-wide bay between these mountains, or by road, as the peaks suddenly come into view round a sharp bend, the Pitons take your breath away. It’s no wonder they’re the instantly recognisable symbols of St Lucia: what else could compete? 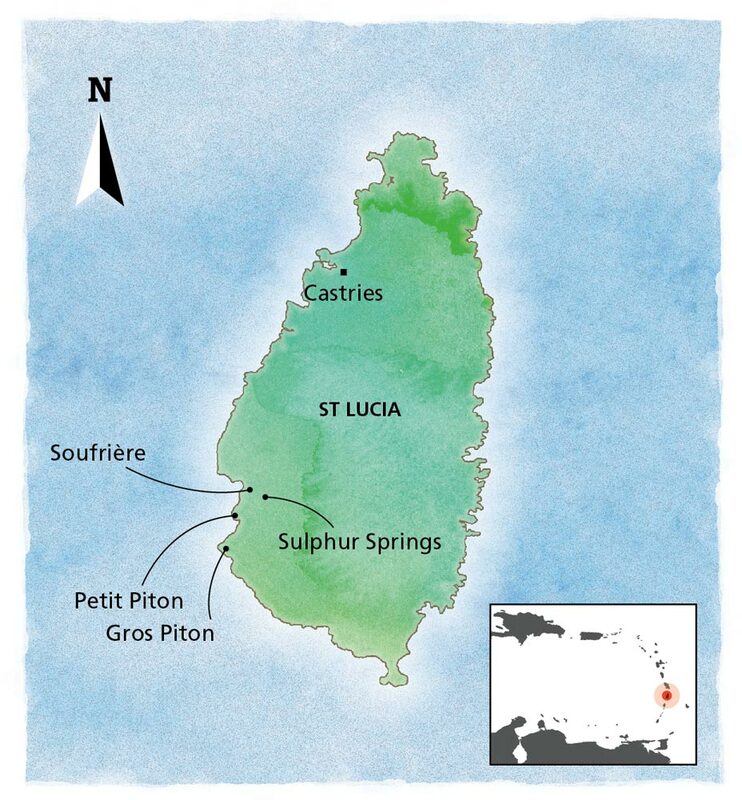 Gros Piton, 2,530 feet high, and Petit Piton, a mere 2,438 feet, are volcanic spires: evidence of the geothermal forces that still shape the landscape of St Lucia. 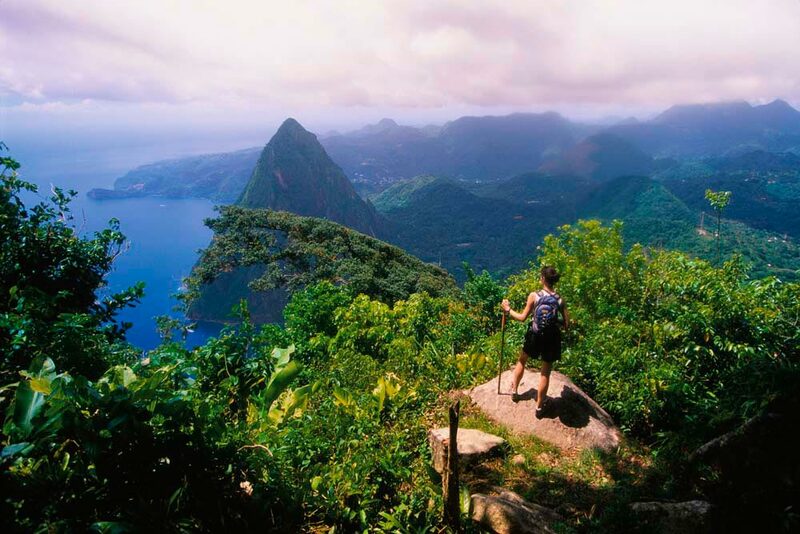 Towering above the south-western coast, the Pitons are landmarks for sailors, a refuge for wildlife, and reminders of the lush and rugged wildness of their island. 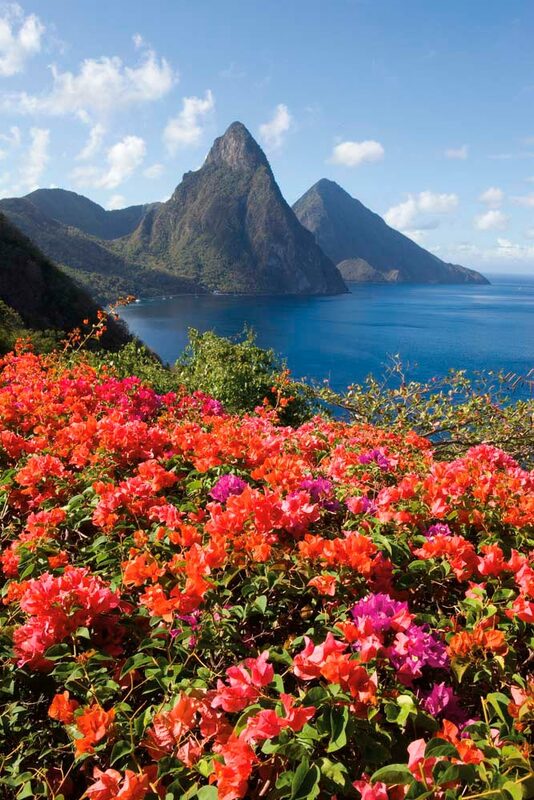 For visitors to St Lucia, the question is north vs south. North: the workaday bustle of Castries, the all-inclusive resorts and high-end shops around Rodney Bay, the weekly street party at Gros Islet, the luxury villas of Cap Estate. South: the old-time creole charm of Soufrière, fishing villages strung along the coast, cocoa estates in the hills, boutique hotels nestled in the rainforest. You might think on an island this small — not quite twenty-eight miles from tip to tip — you shouldn’t have to choose. But though Castries is only twelve miles from Soufrière, flying like a bird, it’s thirty-three miles by car, thanks to the continuous zigging and zagging and doubling-back of the road as it hugs the precipitous terrain. And it’s a slow thirty-three miles. You can’t speed around these curves — and why would you want to, and miss the astonishing views over valley and sea? Most visitors choose the north, and the proximity of nightlife, shopping, and deckchairs. 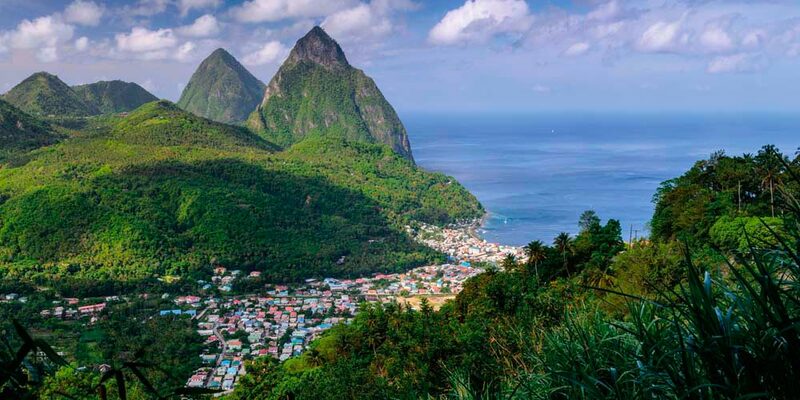 But the knowing minority who appreciate the luxury of landscape and the indulgence of tranquility feel the magnetic pull of St Lucia’s south — the country around the Pitons. Just north of Petit Piton, the coastal town of Soufrière sits at the mouth of a gentle valley. Fishing boats painted in colourful stripes pull up along the shingled bay, and Soufrière, with a population of about eight thousand, manages to look both neat and ramshackle at the same time, both busy and laid back. The surrounding area is thick with history. 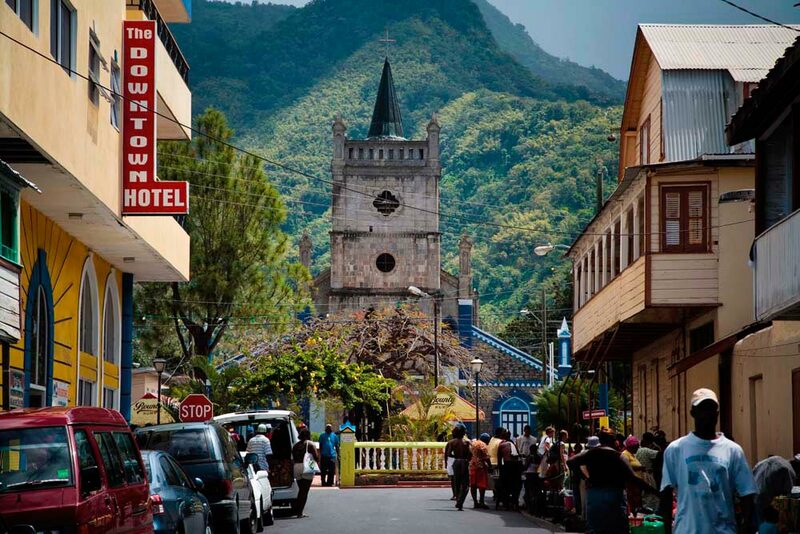 This fertile volcanic soil was carved up into agricultural estates by early French colonists in the seventeenth century, run on the labour of enslaved Africans; Soufrière at one time was the de facto French capital of St Lucia. Much of the wooden creole architecture has disappeared over the decades in a series of fires — most recently, in October 2015 — but just enough survives to give the visitor a sense of Soufrière’s old townscape of steep-pitched roofs and fretworked eaves. The French named the town for the nearby sulphur springs — another sign of volcanic activity — which they believed had therapeutic qualities. Modern-day visitors agree. About two miles outside of Soufrière, the springs are the remains of a huge volcanic crater, once three miles across, which collapsed aeons ago. Locals like to call it “the world’s only drive-in volcano” — and, true enough, the action starts just feet away from the carpark. Rich in minerals — not just sulphur, whose smell is immediately recognisable, but iron and copper as well — the spring water emerges in hissing plumes of steam, with a temperature of 170 degrees Celsius. Obviously, you won’t be swimming there, but a short way downstream, cooled by surface streams, the sulphurous waters form pools of mud reputed to rejuvenate the skin and cure various ailments. You can also “take the waters” at nearby Diamond Gardens, part of one of the oldest estates around Soufrière, established in 1713. The mineral springs here excited much interest in 1784, when the French governor of the time, the Baron de Laborie, had samples shipped to Paris to be analysed. The favourable report that came back persuaded the French government to build a series of mineral baths, for the therapeutic use of troops stationed in the island. In the “Brigand Wars” around the time of the French Revolution, the baths were destroyed, but the owners of Diamond Estate continued to bathe in the warm spring water, and in the 1980s the restored baths were opened to the public. 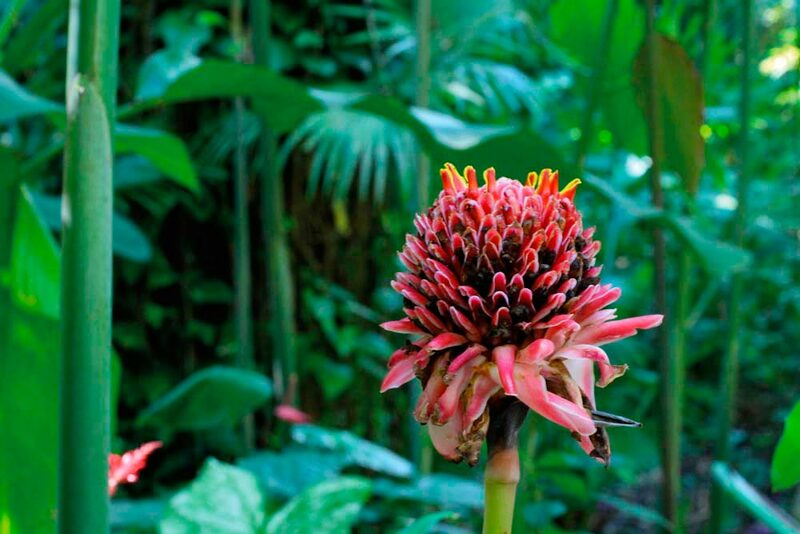 Set among the lush foliage and blooms of St Lucia’s oldest botanical garden, the indoor baths and outdoor pools offer a relaxing soak, said to be especially good for rheumatism. Nearby Diamond Falls, a short stroll away, cascades nearly sixty feet down a rock face of ever-changing hue, stained by the minerals in the water — green, ochre, pink. With your muscles and joints well primed by the mineral waters, you’re finally ready to tackle the Pitons themselves. 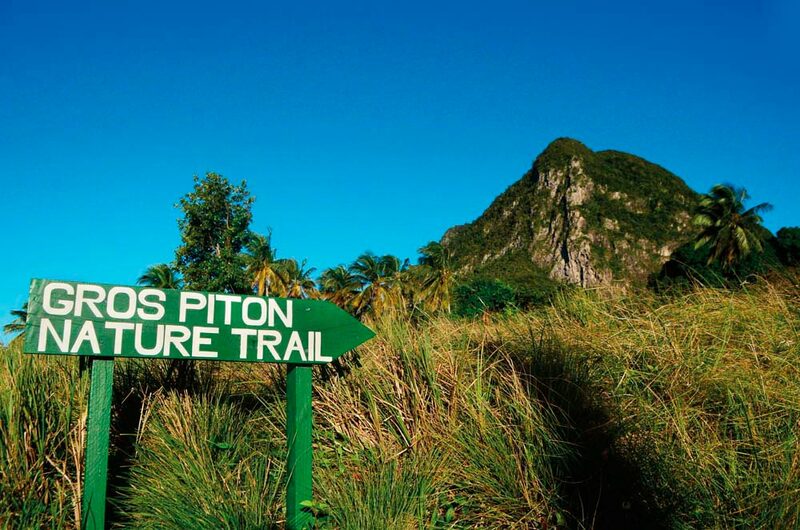 Though a hundred feet higher, Gros Piton is the easer of the two, with a well-kept — though steep! — trail to the top, including rough steps cut into the rock. The climb begins in Fond Gens Libre, a village named for the “free people” — African Maroons escaped from the slave plantations — who found refuge here. A guide is essential. The climb can take anywhere from two to four hours, depending on your level of fitness and energy, and the reward at the top is the magnificent view of sky, sea, and surrounding mountains. The handful of people who have also climbed Petit Piton say the view from that summit is even more spectacular — but the ascent is also a much more serious and occasionally risky proposition, including some honest-to-goodness rock climbing and ropes. Don’t even think of it if you don’t have a head for heights. Far, far below is the dark, deep water of Anse des Pitons, the bay nestled between the mountains. 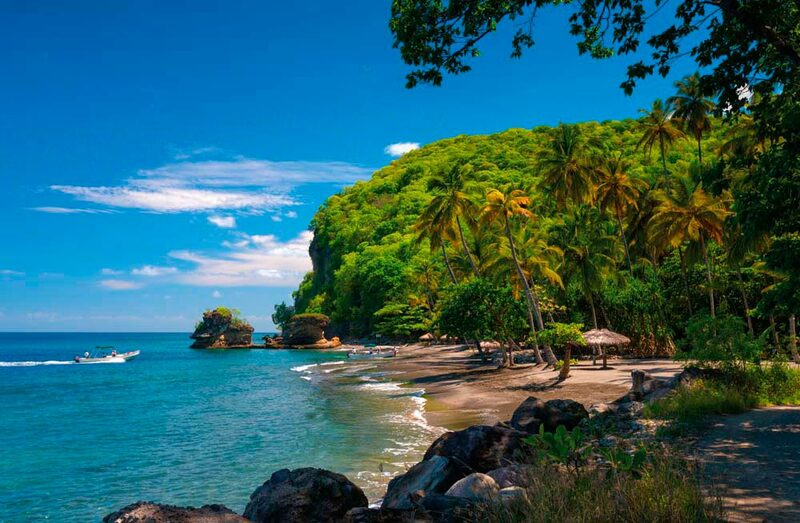 To get there by land, you must pass through the grounds of the luxury resort built along the sloping ridge connecting the peaks — by law, beaches in St Lucia must be accessible to the public. Down at the beach itself, the natural black volcanic sand is covered by imported white sand, infuriating local environmentalists, but this human intrusion ends at the water line, where the bay shelves rapidly into deep water. The sea here is rich in corals and other submarine life, protected by a national marine reserve. And even if you prefer to stay close to the surface, a swim here should be one of the most memorable of your life. On either side, the spectacular Pitons, like great pillars or horns; below you, pristine water, clear as glass.